Boesenbergia rotunda is a herb from the Boesenbergia genera under the Zingiberaceae family. 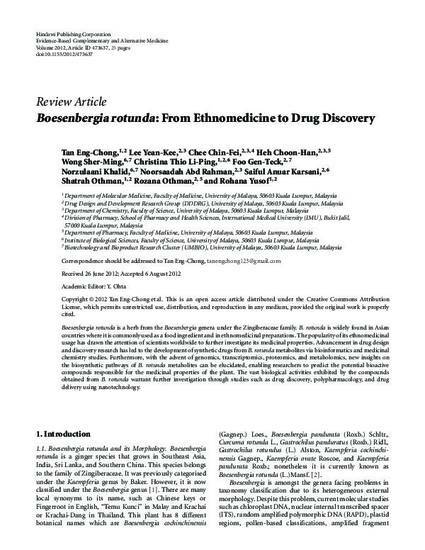 B. rotunda is widely found in Asian countries where it is commonly used as a food ingredient and in ethnomedicinal preparations. The popularity of its ethnomedicinal usage has drawn the attention of scientists worldwide to further investigate its medicinal properties. Advancement in drug design and discovery research has led to the development of synthetic drugs from B. rotunda metabolites via bioinformatics and medicinal chemistry studies. Furthermore, with the advent of genomics, transcriptomics, proteomics, and metabolomics, new insights on the biosynthetic pathways of B. rotunda metabolites can be elucidated, enabling researchers to predict the potential bioactive compounds responsible for the medicinal properties of the plant. The vast biological activities exhibited by the compounds obtained from B. rotunda warrant further investigation through studies such as drug discovery, polypharmacology, and drug delivery using nanotechnology.